Fox Terriers are one of the most sought after, and prolific, breeds in Steiff’s kennel club. This Steiff “Caesar” Fox Terrier from 1911-17 sold for $995 in 2015. The Steiff toy company from Germany introduced the jointed Teddy bear as we know and love him today at the turn of last century – forever branding the company as “plush royalty.” However, Steiff also has a long and proud history of creating lifelike and loveable dogs. These cute canines are the second most popular collecting category behind bears. Fox Terriers are one of the most sought after, and prolific, breeds in Steiff’s kennel club. These energetic and fearless pups have appeared in Steiff’s product line since the late 1800s. Let’s take a brief look at their Steiff history to see why they are universally considered top dogs by collectors. This handsome guy on wheels from the early 50’s sold for $539 in 2013. Steiff often took inspiration for new product launches from popular cultural trends. Fox Terriers started to gain prominence in the last quarter of the 19th century. In 1876, the Fox Terrier Club of England was established, and in 1885 the American Fox Terrier Club followed suit. Fox Terriers took top honors at the Westminster Kennel Club Dog Show in 1907, 1908, and 1909. It was clear that this breed captured the hearts and minds of dog fans. As such, Steiff wasted no time in providing enthusiasts with their versions of these popular pups. Fox Terriers made their first appearance in 1899, just a handful of years after the company’s debut commercial catalog launch in 1892. 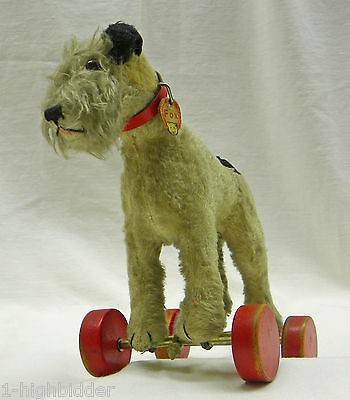 Typical to the period, Steiff’s first Fox Terrier came on metal wheels and was made from felt. Through the mid-1940s, close to 40 different models were produced in practically all forms, including sitting, standing, and lying toys; woolen miniatures; hand puppets; pincushions; pull toys on wooden wheels; ride-on toys; and waterproof bath toys. Naming products took on new meaning and importance in the mid-1920s at Steiff. Although the company experienced exponential growth during the first quarter of the 20th century, many of their core designs and business practices remained unchanged since their introduction. Around 1924, Steiff really started to adapt their product development and communications strategies to match the carefree, upbeat culture of the “roaring 20s.” Steiff updated or launched many new pets that featured distinctly youthful, playful, and innocent personalities. They started using “jellybean” colored mohair and velvet fabrics on some of these introductions. And, they began giving their dogs and cats gentle, childlike names, such as “Charly,” “Waldi,” “Treff,” and “Fluffy.” Previous to that, most were noted generically or as their biological breed. Given their popularity, Fox Terriers were a big part of this strategy. As such, new Fox Terriers introduced in the second quarter of the 20th century were named “Ajax,” “Spotty,” “Foxy,” and “Strupp,” among others. As part of an overall update, new Fox Terriers introduced in the second quarter of the 20th century were named “Ajax,” “Spotty,” “Foxy,” and “Strupp.” Here we have a sitting Foxy. Midcentury, Fox Terriers continued to be a blue ribbon breed for Steiff. They were among the first items produced once the factory was up and running for toy making business in the late 1940s. A Fox Terrier made from artificial silk plush in four sizes ranging from 10 to 29 cm in 1949 lead the pack. Just a handful of years later, when mohair became available on a commercial scale, playful Steiff Fox Terriers as stand-alone toys, puppets, and on wheels again graced children’s toy rooms across the globe. 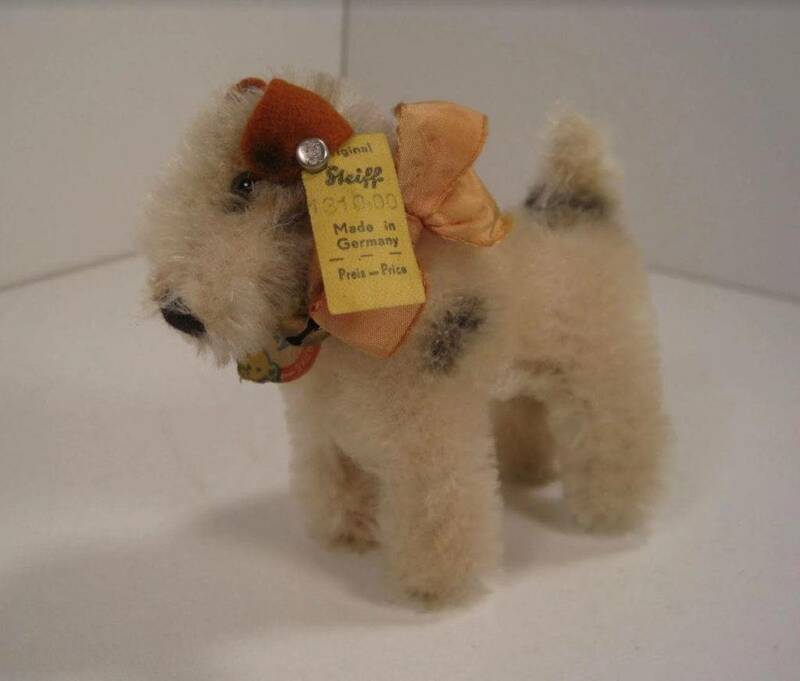 Steiff would go on to design and produce over 20 Fox Terrier designs from the late 1940’s onward, and a Fox Terrier of one sort or another has appeared in the line almost continuously to this day. 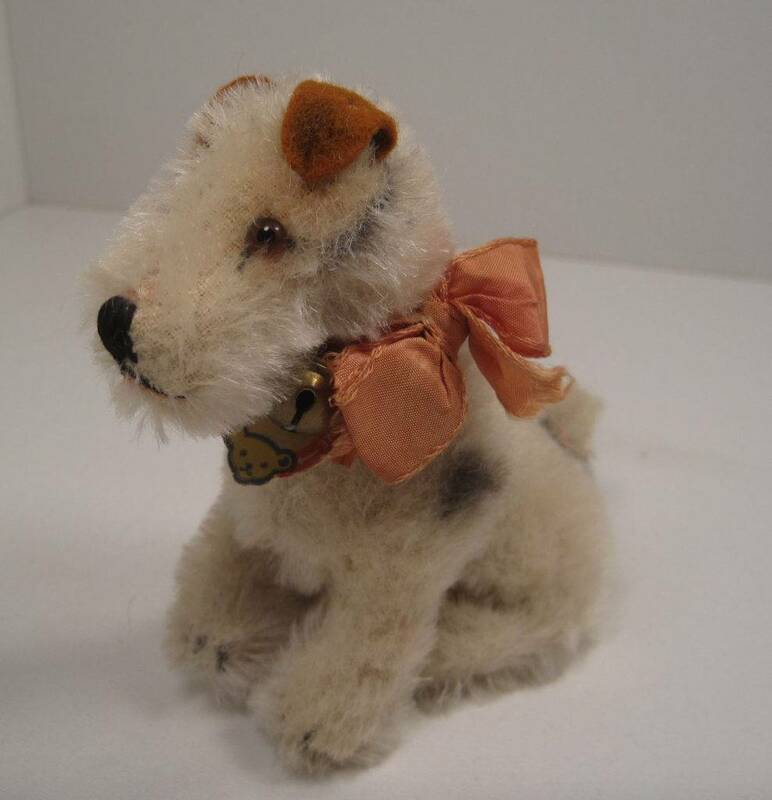 Perhaps the most popular vintage Steiff Fox Terrier among collectors today is the company’s version produced from 1949 through 1975, called Fox up to 1953. Shown here is Fox/Foxy 10 cm. Perhaps the most popular vintage Steiff Fox Terrier among collectors today is the company’s version produced from 1949 through 1975. He is beloved for his gentle yet authentic appearance as well as his natural charm posing with dolls. This design was called Fox up to 1953 and Foxy from 1954 onwards. He was made in 11 sizes ranging from 7 to 36 cm over time. 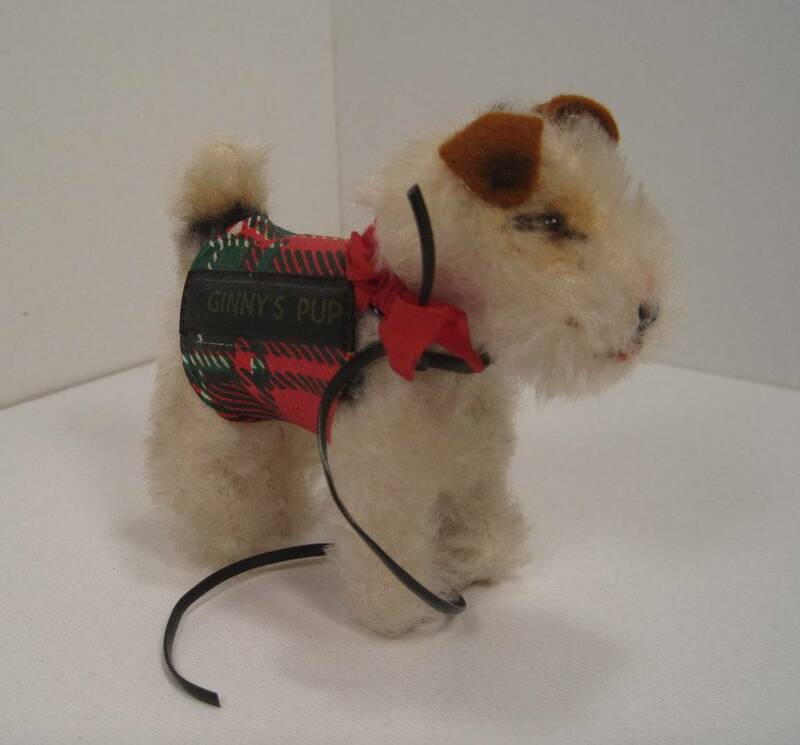 Collectors may recognize the 8 cm version as the one sold with the Vogue Doll Company’s “Ginny” doll as Ginny’s pup “Sparky” in 1956. Fox/Foxy dogs were standing on all fours and made from white mohair detailed with black and tan airbrushed spots. The smallest versions had felt ears while the larger ones had mohair ears. All had brown and black glass pupil eyes and a simple hand embroidered nose and mouth. This model was also produced as a pull toy on wooden wheels in 17 and 22 cm from 1949 through 1961, as a ride-on model from 1949 through 1966, and sitting in three sizes ranging from 10 to 17 cm in 1953 through 1955. 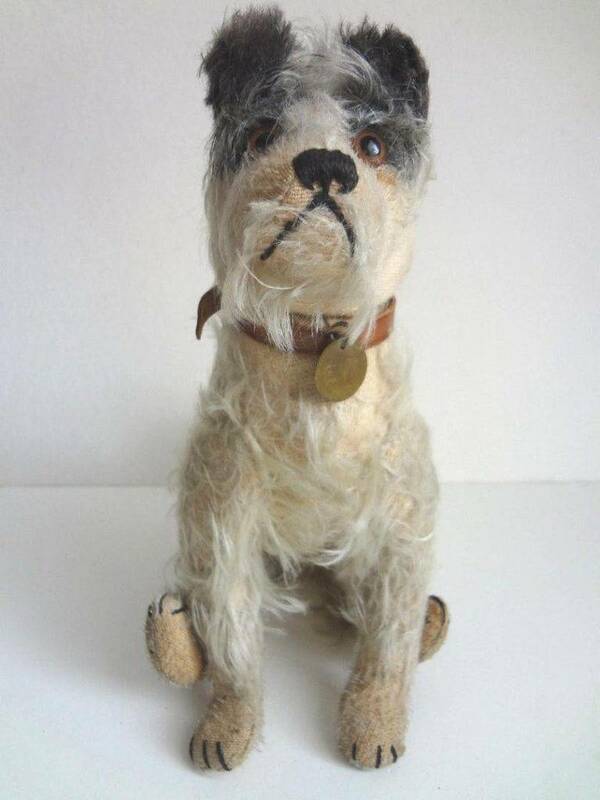 Meet “Sparky,” the 8 cm version that was sold with the Vogue Doll Company’s “Ginny” doll as Ginny’s pup in 1956. As always, something is worth what someone will pay for it. Steiff Fox Terriers are always in demand with collectors. And the good news is that because so many were produced for so long, fine examples appear on the secondary market with some frequency. Prewar models and novelties, for the most part, demand the lion’s share of interest and “value,” with examples in very good to excellent condition with ID often selling in the $750-2,000 range. Midcentury examples, including pull toys, stand-alone, and puppets in very good to excellent condition with ID often trade hands in the $100-400 range. Newer plush items, usually made as toys, may deliver $40-120.